One of the most interesting changes in the business world that all of us have experienced recently, with the booming of social networks, it’s surely the job market. I had my first experience of how the job market was changing back in 1998 when I had my first job interview on a chat (it was for an internship in the first Italian online community and I ended up getting the job)- well before Facebook and LinkedIn changed the rules of the game! Let’s see what’s new on the Job Market. Raise your hand if you have a LinkedIn profile. Mine is here, in case you are curious to learn more about me. 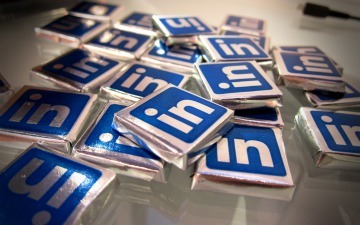 LinkedIn announced this year they surpassed 100 million users. Incresingly, Headhunters and companies rely on LinkedIn to find their next talents. And having worked in the US for a while, I have to admit it’s quite surprising how often I got emails and messages with job offers while my location was “New York” (this doesn’t really happen that often in Europe, and now that my location is Milan, Italy). Now, raise your hand if you have a professional profile (I mean like the one you have on LinkedIn) on Facebook. Not many of you, I am sure, have the Facebook job App. 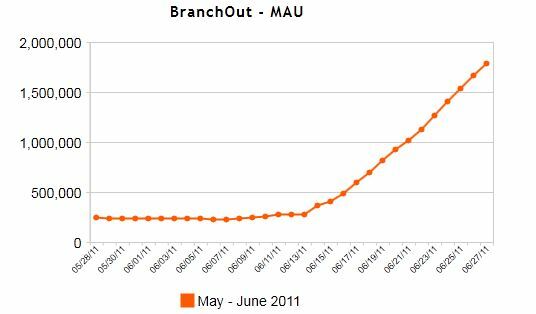 Facebook’s Job app is called BranchOut and it recently went viral on the popular social network, as you can see from the figure above (Source: Inside Facebook). Nice work (allow me the expression) Facebook decided to have the app importing your LinkedIn data to have your profile ready in just a few clicks. A lot less work than the one required to fill in some job applications on some companies’ websites. One of the things that I like the most of BranchOut is the ability to let you know who in your network is “closer” to a specific job post. And this is done in a much much nicer way than LinkedIn. So, what happened to Monster.com? Before the job market moved to LinkedIn and (more recently and yet just a little) Facebook, Monster was “the” place for the job market. Well: Monster is back! The company today announced through a press release they just launched a new Facebook app. BeKnown. If you can’t beat them, join them. This must have been the thought of Darko Dejanovic, global CIO and head of product at Monster Worldwide, who proudly spoke about the Monster-developed Social Referral Program (SRP) embedded in the facebook app, which encourages BeKnown users to pass along specific jobs through their BeKnown network. The Social Referral Program amplifies a company’s employee referral network and extends reach to passive candidates. Currently in beta, the referral program will be rolled out to select Monster customers. My name is Ali and I work for BranchOut, I just wanted to say thank you for covering us and please let me know if you have any questions. Have a great day/happy networking! Thank you Ali, I will in case of need! I’ve played around a little with BranchOut and BeKnown. They’re quite similar – I know their product managers will deny that for ever but there’s my two cents on the matter. What will be interesting is to see who trumps on the referrals side. Apparently LinkedIn is also working on a referral engine and a startup – topprospects is also on the case. Thank you for your comment – I also liked your post.